A strategy game with logic elements, in which the players assume the role of a hacker supporting his teammates by hacking security systems. 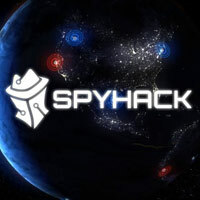 Spyhack was developed by the Polish developer Big Flat Potato and published by Ultimate Games. Spyhack is a strategy game, in which one assumes the role of a hacker supporting agents on their infiltration missions. The game described herein was developed by two Polish companies: Big Flat Potato and Ultimate Games. In Spyhack, players observe the action from the top-down perspective, however, unlike many other games, one does not control the characters. Instead, players assume the role of a hacker who remotely takes control over different elements of the environment in order to allow other agents succeed in their missions (the game features both espionage and action-packed missions). Players are often required to complete simple puzzles – in order to solve them, one has to use pieces information stolen from databases. Players are also tasked with warning their fellow agents of any threats and giving them commands that are crucial to succeed. Additionally one has to make a number of tactical decisions, such as the call for support or creating a diversion. Spyhack features only the single-player mode. Spyhack features relatively simple 3D visuals that are not bound to impress anyone, however, this results in a clear user interface. Expectations: 6.7 / 10 calculated out of 3 players' votes.